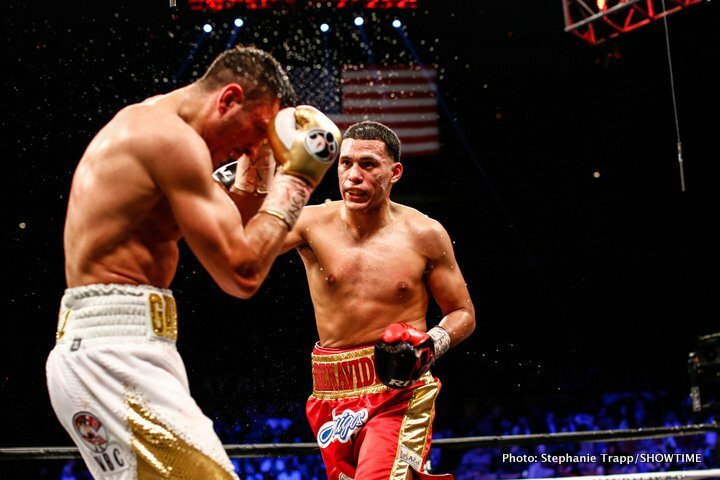 By Jeff Aranow: Trainer Alex Ariza says his fighter WBC super middleweight champion David Benavidez was interested in stepping in to face middleweight champion Gennady ‘GGG’ Golovkin after Saul Canelo Alvarez pulled out of their May 5th fight. Ariza says that Golovkin’s team called Benavidez and asked them not to call him out for the May 5 date. Ariza says the 21-year-old Benavidez could have fought GGG at a catch-weight or even at 160. He thinks Benavidez could have made 160 without any problems. Further, Ariza said that Benavidez had gotten the better of Golovkin during several sparring sessions in the past when he was using him as a sparring partner. “When Canelo fell out, they [Benavidez’s team] were calling out Golovkin, ‘We’re on 3 weeks training, we’ll take the fight in 2 weeks, right now,’” Alex Ariza said to Fighthype about David Benavidez volunteering to fight Golovkin for his May 5th date. “So they called us up, begging us to stop saying it, and stop bringing up David’s name to Golovkin,” Ariza said. Ariza is a little late in talking about Benavidez stepping in to fight Golovkin. It’s too late now, and the fight is over with. Golovkin is no longer in need of a replacement opponent, as his promoter Tom Loeffler picked Vanes Martirosyan to step in. I’m not sure why Ariza wanted Golovkin to fight someone from a higher weight class so badly. In the same interview, Ariza said it’s a cherry-picking move for a pound-for-pound fighter to face someone in a weight class below in talking about Golovkin fighting junior middleweight Vanes Martirosyan on May 5, and yet in the same interview he criticizes him for not agreeing to super middleweight Benavidez. It would be better for Ariza to be calling out other super middleweights like Gilberto ‘Zurdo’ Ramirez, Callum Smith and George Groves on his behalf instead of Golovkin and Saul Canelo Alvarez. ”I think David got the best of Golovkin several times in sparring,” Ariza said. I doubt that Golovkin went all out during the sparring sessions with Benavidez to try and hurt him. Sparring is a different situation as fighting. In looking at the problems Benavidez had in his two fights against Ronald Gavril, I don’t think he would be a problem for Golovkin. Benavidez struggled to beat Gavril in their first fight. That version of Benavidez would likely lose to Golovkin and lose badly. Benavidez looked drained in making the 168 lb. in his last two fights. I don’t think Benavidez would be able to make 160 for a fight against Golovkin. That’s crazy. Benavidez would be dead at the weight, even if he made it, which I don’t think he would. It would be pure misery for Benavidez to try and make 160. There would have to be a huge weight penalty for the fight to make sense, because if Benavidez came in 5 or 6 lbs. over the 160 lb. middleweight limit, it would be a complete joke. There would be no reason to even have the fight at that point unless Golovkin was completely desperate for an opponent, which is it not. ”De La Hoya keeps saying he doesn’t have a dance partner for Canelo,” Ariza said. ”There he is right there,” Ariza said pointing to Benavidez. “He fought Chavez. How come nobody was crying when Manny [Pacquiao] fought guys like [Antonio] Margarito, [Ricky] Hatton, [Miguel] Cotto, [Joshua] Clottey. I know he [Benavidez] could make a catch-weight. We don’t have any problems making weight,” Ariza said. De La Hoya isn’t going to ever use someone like Benavidez as an opponent for Canelo. The reason he won’t is because Benavidez isn’t a popular fighter yet, like Chavez Jr. was, and he’s so much bigger than the 5’9” Canelo. Benavidez hits too hard and he throws too many punches as well. With Canelo’s stamina problems, he can’t be fighting someone that is capable of throwing 1000 punches per round like Benavidez. That would be an insane move on De La Hoya’s part to throw Canelo into the ring with a fighter with that kind of work rate. Canelo turns red in the face and gasses out when he throws 50 punches. If Canelo had to compete against Benavidez with him throwing 100 shots per round, it would be a massacre. De La Hoya would know all this ahead of time, and he wouldn’t make that fight. ”He was strong. I always say he’s a 160 pounder,” Ariza said about the 6’2” Benavidez. “Believe me; if Chavez could make 160 pounds, then that guy [Benavidez] can make 160 lbs. I’m being serious. If they really want a dance partner for Canelo and they want to be serious…Canelo and those guys are going to yak and cry their way out and look for any excuse not to fight him [Golovkin] again. That’s fine. If they’re really looking to make a statement to fight people, these are the guys you have to fight,” Ariza said in suggesting that Canelo and Golovkin need to fight WBC super middleweight champion Benavidez. Benavidez looked sickly in making 168 in his two fights against Gavril. I don’t think for a second that Benavidez could lose an additional 8 lbs. for him to fight Golovkin or Canelo. If anything, Benavidez needs to move up in weight to 175, because he’s starting to look really bad making weight. Benavidez has clearly outgrown the super middleweight division at 21. He needs to move up to light heavyweight so he can fight guys his own size, and not hurt himself trying to get down to the 168lb limit. Forget about Benavidez making 160. That’s a pipe dream on Ariza’s part. He’s not going to make 160, and if he ever tries to, he could hurt himself. That’s too much weight. Benavidez’s management needs to try and line him up to fight George Groves, Callum Smith or Gilberto Ramirez. Those are the fighters he should be looking to fight, not GGG. Benavidez should have fought in the World Boxing Super Series tournament, because he could have made a name for himself against Groves and Smith. Wow! Ariza is already comparing Golovkin to the 39-year-old Pacquiao, even though he’s still unbeaten and holding down the IBF/IBO/WBA/WBC middleweight titles.